Gov. Eric Greitens’ legal team has received evidence being used against it and has questions about the prosecution’s procedures. St. Louis Circuit Attorney Kim Gardner met defense lawyers for Governor Greitens in court to turn over the first round of evidence on Tuesday. KMOV-TV reports the evidence includes about 40 pages of documents and some DVDs. The Circuit Attorney’s office declined to comment on the specifics of the evidence. The discovery list includes emails between Greitens and a woman who he’s alleged to have taken a compromising photo of and then threatened to blackmail. According to the TV station, Greitens’ attorney, Ed Dowd, said the photo of the woman is a professional headshot, which he called “exceptionally misleading”. KMOV reports the defense filed two motions Tuesday, one of which questions the Circuit Attorney’s use of a private investigative firm. 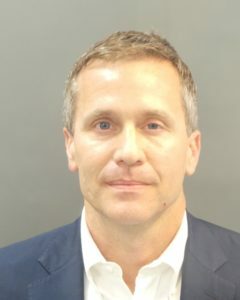 Greitens, a Republican, has pleaded not guilty to a felony invasion of privacy charge. He’s called Circuit Attorney Gardner, a Democrat, “a reckless liberal prosecutor who uses her office to score political points”. His attorneys have filed a motion to dismiss the charge against him. KMOV reports that the defense declined to comment further in the case and that the parties are to meet again Tuesday at 10:00.